We have designed and evaluated around 10 serious games under the EU Leonardo Transfer of Innovation Project: Game On Extra Time (GOET) project http://goet-project.eu/. The project supports people with learning disabilities and additional sensory impairments in getting and keeping a job by helping them to learn, via games-based learning; skills that will help them in their working day. These games help students to learn how to prepare themselves for work, dealing with everyday situations at work, including money management, travelling independently etc. 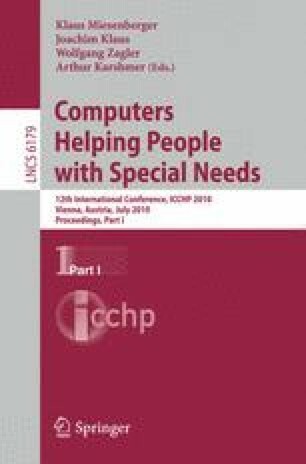 This paper is concerned with the potential of serious games as effective and engaging learning resources for people with intellectual disabilities. In this paper we will address questions related to the design and evaluation of such games, and our design solutions to suit the individual learning needs of our target audiences.